As you study for the CCIE Collaboration Written exam, determining "what" to study can be daunting sometimes given the number of items listed in the blueprint. I mean, where do you start? I've always thought that you should target your weakest CCIE Collaboration topics first. That way, you'll never be completely clueless about a given question (or task) on the lab. But, how do you determine what your weak topics are? And how do you know when your weakest topics aren't the weakest anymore? 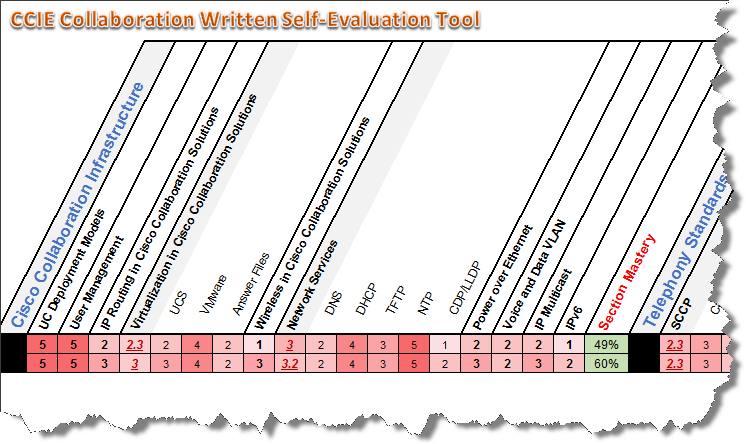 Self-Evaluation - How Prepared Am I for the CCIE Collaboration Written? I've created the spreadsheet below to help you grade your progress on each topic as you progress through your studies. Feel free to copy it and use it for your own purposes. Note on Version 2: I've uploaded a new version of the spreadsheet that makes it easier to read and improves the mastery calculations (using each sections weighted importance). The updated calculations should give you a more accurate measure of your knowledge level and readiness for the exam based on the section weights that Cisco has assigned. Also, values in underlined red are averages of all subtopics in that group - formulas are protected to keep you from overwriting accidentally. Within the spreadsheet, you are prompted to grade your knowledge level for each subtopic with a value from zero through five. Zero represents no knowledge at all, while five indicates subject-matter expert level knowledge. In my mind, it's actually quite difficult to achieve a value of five as I reserve that for truly elite knowledge - are you really a SME for this topic? Be honest! There's no magic value that says - "You're now ready to take the exam!" Instead use this tool as a way to supplement your other study resources and perform some very granular self-evaluation to assist in determining topics that need additional attention before taking the CCIE Collaboration Written exam. I believe scoring a 4 or 5 on any given subtopic requires extraordinary study, experience and effort. Personally, I reserve these scores for true strengths that I feel separate myself from my peers. Remember, achieving a "five" in a subtopic is reserved for true subject mastery. That said, anything above 60% mastery in a given topic is exceptional! 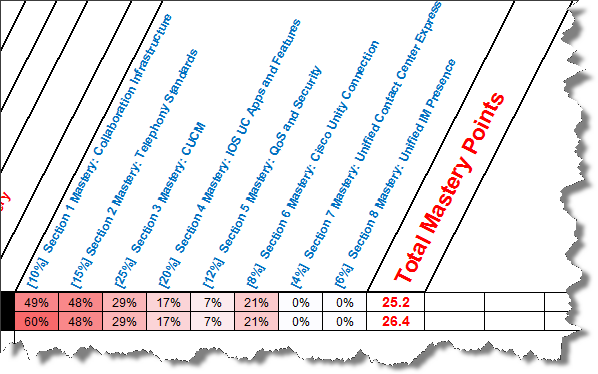 The far right of each row in the spreadsheet calculates a value called "Total Mastery Points" using your relative mastery levels for each blueprint section (and the importance given to the section by Cisco). Remember, there's no magic number here to show that you are ready for the exam. Instead I suggest that you instead re-evaluate yourself every couple of weeks and use this value as an indicator of your progress towards the ultimate goal. Good luck! I hope that this tool helps you focus on your studies. I know that I've spent way too much time tweaking it and fixing formulas, etc.! If you have any additional ideas on how to make this a better tool - or if you have one of your own that you'd like to share - please use the comments below! is there any possible way that there is some type of lock a previous person did for background images on call manager? Can you try the format below? Note that there should *not* be a "return" before the "URL" portion - it's really just long string of characters. Also, duplicate the case of all of the letters in the sample below. Make sure that you place this on all TFTP servers AND I'd restart the TFTP service as well. See the sample list.xml image I attached. Also, make sure that you've placed it on all TFTP servers and restart the TFTP services before testing. Awesome! Glad it helped you out. Baber, you could do something like the following and apply to your outbound dial-peers. Be warned, the call will keep trying potential dial-peers for a way out if you block specific dial-peers. Make sure that all paths are accounted for.. There are also some bugs in 9.1 when using custom announcements when only 1 user is logged in. Thanks for the warning! Do you happen to have a bug id or additional information? Was it fixed in a 9.x release? How to check the CUC Virtual Memory utilization in CLI. i am getting the Low Available Virtual Memory in cisco unity Connection. A process with a memory leak starts to allocate too much lower memory. In order to protect the operating system kernel, the OS starts to kill processes using lower memory. This causes various services to fail depending on which ones are killed by the OS. This results in low available virtual memory alert in RTMT, as well as axl service down alert. Disabling CSA (utils csa disable) prevents this problem. After this problem occurs, rebooting the system restores the system to operational state. Note: This is documented in Cisco bug ID CSCsz11007 (registered customers only) . I have CUC Version 9.1.2.10000-10. They problem description mentioned as Memory. the Memory referring as Virtual Memory or Physical Memory. because i am getting as Low Available Virtual Memory. You can try "show status" to get some information about memory usage/status. If a specific process is not playing nice, you can also try "show process using-most memory". I'd also suggest looking at when the alarms are appearing - are they consistently there or only sporadic, during certain times of the day? Perhaps it can be correlated to another event. Hope this helps! So are broadcasts supported with queuing? Since this is straight from Cisco's Data Sheet ● Native queuing allows users to queue calls to hunt pilot using top-down, circular, longest-idle, and broadcast methods. It also provides the flexibility to configure queue depth and hold time, play unique announcements and Music on Hold (MoH), log in and log out users from a queue and basic queue statistics (from the phone). Let me try to explain based on how I've seen it work when tested. You can still configure the line group to use a broadcast distribution algorithm. Multiple available phones will ring when the call comes inbound. However, if all users are busy - the call will queue. Once a phone in the line group becomes available - the queued call will be delivered. If a second phone in the line group becomes available while the first phone is STILL ringing - the first user will continue to be the only phone that rings. The call does not seem to broadcast when it leaves the queue, it's delivered to the first available phone. I see that makes sense. So the agent better pickup the phone call or log out for the hunt group before disconnecting with their current call. Thanks. I do not think anyone can find Triple Combo any more. There are no downloads anywhere on the Internet that I can see. Paul, Thanks for the continued updates on TranslatorX - I see version 10.0(2) is out now! Can you confirm that Triple Combo has been replaced by TranslatorX in functionality (at least in Cisco's eyes)? I still see people looking for Triple Combo, even though it's not available for download anymore. I have downloaded that xlsm file. Really worthy share mate. Good Luck. i am using CUCM 6.1, my client wants all the details of registered and unregistered phones on daily bases. so i want to know that is there any query helps me to get all these details from Cucm to my local db server. now days i am using Show risdb query phone command to get session output of these details. but i have an issue that when i run this command to my subscriber servers than i get all the require detaiils correctly. but when i run same command on publisher server then count/details of registered phones is showing correct. but the count/details of unregistered phones is not matching with my actual data. As i verify the Publisher unregistered phones details i found that among of these unregistered phones some of my phones are registered on my other subscriber servers. I am looking ahead to make career in networking and so finding a Networking Certifications course which would be beneficial for my career. I'm sorry for the slow reply - have you found a resolution to your problem? I appreciate the kind words! Good luck with your studies! "The Performance and Scalability topic in the Call Queuing chapter of the Cisco Unified Communications Manager Features and Services Guide contains a bullet that says that call queuing is not supported with broadcast algorithm hunt lists. This bullet point is incorrect and should be removed." Tried but no luck..any more suggestions please.